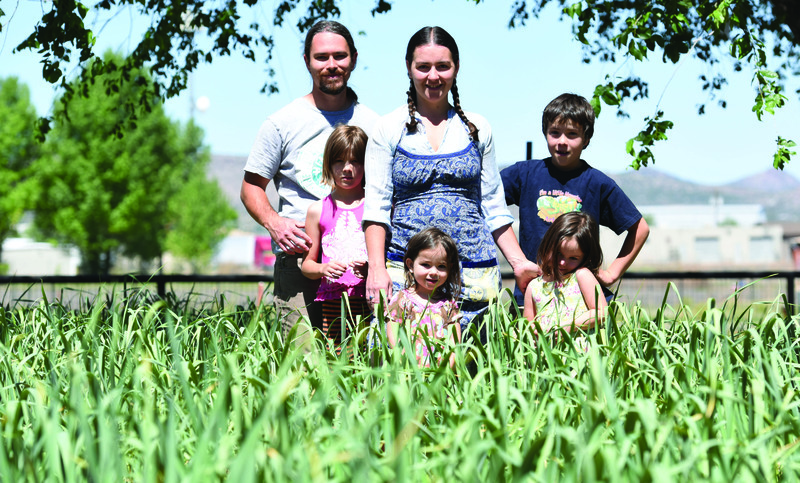 Chris and Sarah Reckards, who have been hired to run the Yavapai County Grown CSA Farm, pose with their family - Samuel, Ariyah, Soraya and Isabella - in their home garden called Loves Gathering in Chino Valley. CHINO VALLEY â€“ Chris and Sarah Reckards and their four children are happiest when they are outdoors planting herbs, growing vegetables or frolicking with the goats, chicken, and family dog on their farm. They respect natureâ€™s bounty as the healthiest way to feed and care for themselves and others. Chris Reckards is an herbalist; his wife is a master gardener; they are now the first full-time managers of YCGrown, the Yavapai County Farmers & Ranchers Collaborative founded in 2012. YCGrown founder Kate Oâ€™Connor Masse cannot be more delighted that the Reckards opted to accept the role of broadening the reach of this collaborative and its Community Supported Agriculture (CSA) program. At this time, the collaborative boasts some 20 area farms, and a couple ranches, that together supply residents from Prescott to Sedona with weekly, or every other week, supplies of farm fresh fruit, vegetables, eggs, dairy, some meat, and other homemade products, including honey. To learn more about YC Grown and the CSA program, visit www.ycgrown.com. Summer share signups will continue through Oct. 13. And the Reckards expect those numbers to expand in the coming months and years. The venture is intended to assure area farms and ranches grow a strong customer base while the community is enriched with freshly grown products not found in most grocery stores, Oâ€™Connor Masse said. YC Grown offers both weekly full and half CSA shares that are delivered to Prescott, Prescott Valley, Chino Valley, Cottonwood, Camp Verde and Sedona. Full shares contain about nine to 12 different items for $25 and half shares have between six and eight items for $15. There are also options for shares on an every other week basis. Oâ€™Connor Masse said she and her husband, Mike, met the Reckards when they relocated from Idaho to Paulden about three years ago. The YCGrown founders were impressed that the coupleâ€™s commitment and devotion to the land and community farming mirrored their own, she said. The Reckards also have social media savvy that has given the collaborative another venue for marketing to both the farming and ranching community as well as to prospective customers, Oâ€™Connor Masse said. In their first year on the job, the Reckards have updated the website to include a newsletter complete with farm-fresh recipes, as well as filling Facebook pages with mouth-watering photos of the vegetables, fruits, as well as flowers, grown on not only their farm, but on the farms of collaborative members. The Reckards, too, are committed to making farm fresh food to low-income families. â€œThese guys have managed to do those things, and work with our farm labor,â€ Oâ€™Connor Masse said. â€œItâ€™s a big community, a collection of like-minded people all trying to do the same thing â€“ take good food and get it to people quickly. â€œWe want to do so many things,â€ said Sarah Reckards who beyond her love for gardening and making natural medicines and ointments is gifted at handmade crafts. She, too, homeschools her children aged 9, 8, 4 and 2. The very name of their farm, â€œLoveâ€™s Gathering,â€ comes from their belief that â€œlove is gathering your garden vegetables â€¦ and love is gathering your community together,â€ Sarah Reckards said.